There are lots of birds to be seen in a big year! We're heading into a new year. A fresh chance to have what birders call a "Big Year," the ultra marathon of competitive birding. 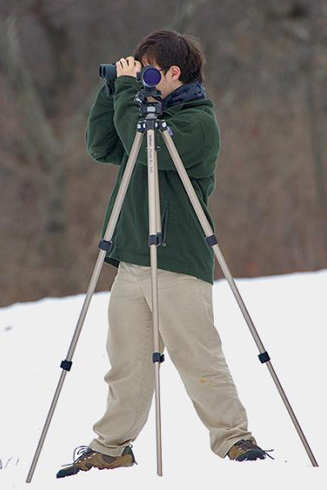 During a Big Year, a few obsessive birders race to see as many species as they can in a specified area. But you could decide to have a Not-So-Big Year, and just count the bird species seen in your yard. For a North American checklist, visit the American Ornithologists' Union. For a checklist by state, see USGS.gov. Happy New Year and good birding, from BirdNote! Or . . . you might decide to have a Not-So-Big Year. Perhaps you’ll just count the bird species seen in your yard. In that case, it’s definitely not too late to start. We can help you find a checklist of birds of your area when you begin at our website, BirdNote.org. Have fun! I’m Michael Stein. Bird sounds provided by The Macaulay Library of Natural Sounds at the Cornell Lab of Ornithology, Ithaca, New York. Boreal Owl call recorded by W.W. H. Gunn. Red-footed Booby call recorded by A.B. Vandenberg. Song of Red-flanked Bluetail from Xeno-canto, recorded by F. Lambert.